FANS of Dragon Brand bird's nest drink may take under 10 seconds to down the contents of the tiny bottle. Few, if any, would realise it takes a cutting-edge $600,000 production line to bottle the popular tonic. That machinery, set up by local food manufacturer Kim Hing Food Industries at its Woodlands factory, was made possible thanks to a government scheme. The firm tapped the Productivity and Innovation Credit (PIC) three years ago. "It was a big investment and the scheme helped," said its executive director Norman Tan. The scheme was introduced in Budget 2010 and enhanced in the Budget last year. Under the scheme, firms can get either tax deductions or cash grants when they invest in equipment to boost productivity. 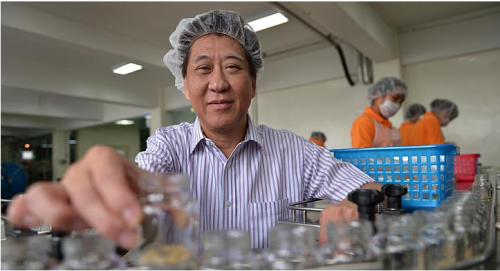 Kim Hing opted for tax deductions of four times what it spent on the new production line. The investment paid off and productivity rose by as much as 70 per cent, said Mr Tan. "Without automation, four workers are needed to wash bottles. Now, one worker can operate a machine that washes the bottles." The production line also has machines that sterilise, fill and cap the bottles of bird's nest drinks. Mr Tan said the PIC helps food manufacturers invest in machinery. "Some companies might not have the capital, so the scheme helps them... With automation, they can expand their businesses. They can also lower production costs and make their products more competitive." He hopes the scheme will keep going for at least five more years. "We probably need about five years to catch up with the standards of food manufacturing industries in (places) like the United States and Taiwan." Mr Tan said firms can also be encouraged to send their staff for training, as skilled staff are needed to operate and maintain new machines. Ultimately, he said, the PIC will help local firms stay competitive internationally. "Our operating costs - rent, labour and utilities - are higher than neighbouring countries', so automation and increasing productivity are the only way to go for local SMEs (small and medium-sized enterprises)."